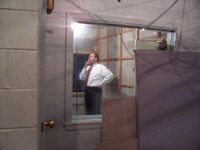 Anybody who worked "on air" at WSM-TV in the years before it became WSMV knew of, and probably spent time in, the old announcers' booth. 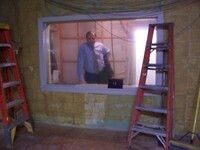 The three pictures accompanying this column are among the last ever made of the booth, as it was being torn apart. It was an odd-shaped little room, roughly 8 X 6, smaller than a jail cell. On my first full day working at Channel 4 back in 1969, I was escorted to the booth so that Boyce Hawkins (our chief announcer) could instruct me on what was expected of me in the booth. After he showed me the ropes, he left, and I worked the rest of Boyce's 6 hour shift. That, I later learned, was one of Boyce's endearing little tactics. Most every one of us (announcers / newscasters / weathercasters) would pull a 6 hour shift in the booth, in addition to whatever on-camera duties we had for that day. Every station break was done live. The announcer would read whatever needed to be read, and then identify the station.... "This is WSM-TV, Nashville". If you worked the late night sign-off shift (which I often did), following Johnny Carson you'd read two minutes of news headlines (while a picture of the National Life Building appeared on the screen), and then the sign-off announcement. It was much like old time radio, but it was television. Over the years, a lot of good, talented people.... some real characters.... spent time in the booth. I'm pretty sure Al Voecks, now part of Gerry House's radio gang, worked a shift from time to time. And Mike Bohan, who also now works with Gerry House, did some announcing from the booth, though I think he avoided the full six hour shift. Keith Bilbry, now an announcer on the Grand Ol Opry, worked many hours in the booth. Pat Sajak spent much of his time in Nashville in the booth, and gained a strong local following as "Your Announcer" during the Saturday night "Bogart Theatre". Pat and I spawned a great friendship sitting in that booth, telling each other war stories and tall tales about our lives. That friendship remains strong more than 30 years later. Ralph Christian (rest his soul) was a long time booth announcer. He took law courses during the day, while he worked the night shift in the booth. Even after he became a successful lawyer, he continued to work the night shift. He would complain about it, but he loved it...... he couldn't give it up. A young man named Johnny Ferguson worked for a time as an announcer. Johnny had been a bit of a rock and roll singer in the early 60's. He actually had one huge hit in 1960.... a song called "Angela Jones". Then, somehow, he ended up in the booth. Nice guy. I've lost track of Johnny. The first time I ever met Dolly Parton, I was working a booth shift, and she was taping the Porter Wagoner Show just a few feet away in the studio. We would always wave to each other. We became pals, 37 years ago. The day Elvis Presley died in 1977, I went to the booth and interrupted programming to read the bulletin that Memphis police were reporting Elvis had died. I read it slowly and carefully.... knowing how it would affect people. Anyhow, the old booth is gone now. It's been completely ripped out, replaced by a sparkling new hallway. 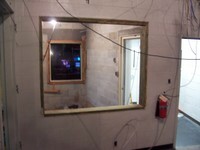 All that remains is the glass window looking into the studio (the one I waved to Dolly through). It's strange how little spaces can take on unrealized relevance in our lives once they're gone. I sent Sajak an email and told him they were tearing down the booth. He wrote back, "Tear down the announcers' booth!! Why don't they just tear down the Eiffel Tower? Why don't they just fill in the Grand Canyon?" That was a great piece, Dan. As a kid I heard an announcement which apparently originated in that booth, a station ID ("WSM-TV, Color 4, Nashville," if I'm not mistaken) which so boggled my precocious little mind that I wrote to NBC to ask why I heard it. You see, I was watching the baseball "Game of the Week" on WNBC-TV in New York at the time! I believe the game was in Atlanta, and apparently the signal was routed through Nashville, along with the station ID, according to the kind soul at 30 Rock who replied to me. I reluctantly confess that such broadcast anomalies fascinate me to this day, though I suspect that you would totally understand. Thanks again for a terrific post and kudos on this morning's tornado coverage which I'm watching via the 'net. i worked at wsm from late 72 until almost christmas of 74, two of the best years of my young life. loved hanging out with marcus harton and mike ragsdale, dan and pat in the old booth. used to drive down to drew's and get food for dolly parton. Who was the afternoon show host who later moved to Orlando? Was his name Judd? You're thinking probably of Jud Collins who's long since retired and still living in Nashville. thank you for describing what a television announcer is, i've been searching for my birthfather for years, i understood him to be one in the kansas city area in the mid 60's. with this information, i may be able to find him, thank you!!!! This is great, the art of the television announcer seems to be long gone, with the introduction of computerised playout systems and pre-recorded announcements. Was there a tv host named Merle Emery back in the 70s? Not Ralph Emery. I remember a WLAC tv host named MERLE EMERY. He wore glasses and was very personable. Often he hosted noon gospel shows that were videoed. I am not speaking of Ralph, who came AFTER Merle. Please send info to "rosalake@nc.rr.com." My husband has been told all his life that his cousin "Bill Carrigan" was an announcer for the Grand Old Opry. He said back in the 40's. Do you show an annoucer by that name back then?